Also, do you have anything on aliases on your website? You mentioned that in class, but I did not know I wanted to follow up with you then!! So here’s a quick tutorial on email addresses, aliases, and forwarders. The term “forwarder” also helps make the concept clearer for most people, a forwarder is the email equivalent to having a phone number forwarded to another number. In other words, email sent to one address (the forwarder address) is automatically redirected to another email address. What’s the difference between an email forwarder and an email account? You should be able to set up multiple email accounts — and email forwarders — through your web hosting service. Email accounts require unique usernames and passwords, and setting up the mail servers in your email application (such as Apple Mail or Microsoft Outlook). 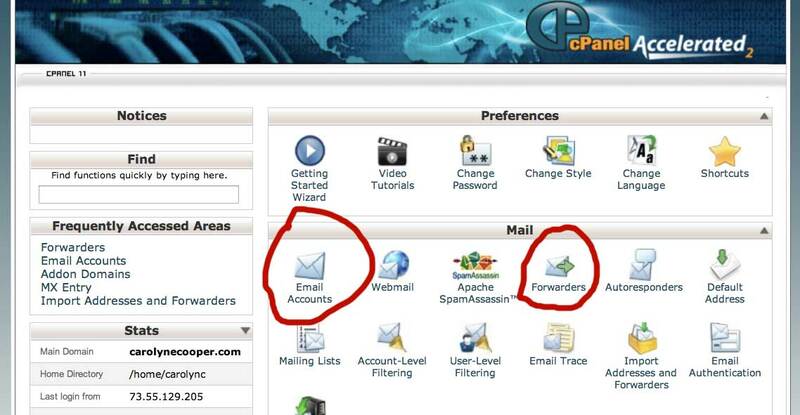 Email Forwarders are simply email addresses that “forward” (i.e.,send) emails to another email address. Forwarders can be very useful for your organization and aren’t difficult. You’ll need an email account to create and use email forwarders. Email forwarders are just an email address that is automatically re-directed to another email address. (Yes, yes, for the pedantic, technically “email forwarder” can refer to the service or to the software, but we’re talking here about the non-nerdy, practical application of the term.) You can’t send emails with an email forwarder. An email account is the email address you use that requires logging in with a username and password and designating the “mail servers” to be used to send and receive email messages. 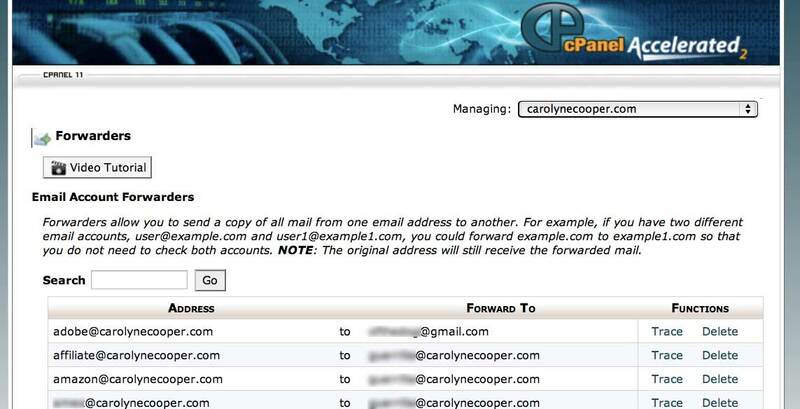 For example, carolynecooper.com@gmail.com is an email account on the Gmail servers, while adeline@carolynecooper.com is an email account using the email servers and software provided by my web hosting service and requiring me to log into their email servers with my username and password to send and receive emails. You always need to log into your email accounts, either with web browser or an email application like Microsoft Outlook or Apple Mail (or one of the many others). Forwarders can be extremely useful to the active Internet user or organization. Here are just a few of the advantages to using email forwarders. Email forwarders (aliases) provide a consistent email address even though the person handling the inquiry changes. We’re all familiar with the general email addresses like customerservice@SomeBusiness.com or info@SmallNon-Profit.org. These are often email forwarders, allowing organizations with a volatile staff or high turn-over rate to avoid constantly changing their contact information on websites, flyers, brochures, and other collateral material. For example, say we’re an animal rescue non-profit with a lot of part-time volunteers helping in the office. Susie usually handles sorting out the general inquiry emails — answering basic questions, directing others to the right person, expediting the emergencies. By making the general email address a forwarder, like “contact-us@LocalAnimalRescue.org,” and re-directing it to Susie’s email account, Susie@LocalAnimalRescue.org, when Susie goes on holiday for a month, we can simply change the forwarder to re-direct the emails to say “Jim@LocalAnimalRescue.org.” Or any other email address, including Susie’s personal email address, if we prefer. The people emailing have no idea someone else is taking care of their inquiries, but they do have a consistent email address for contacting the organization. And if Susie decides to retire or move to Madagascar and work on lemur conservation, it doesn’t create massive problems in updating the contact email address everywhere. Why not just assign one person to handle the email account “contact-us@LocalAnimalRescue.org?” We can do this, however, we’ve now given control over that email account to someone else, so we have to either change passwords every time someone new is going to access the account or have a lot of trust in the people who know the password. There’s also the problem of what I call “email addy hijacking.” We tend to simply hit reply when are answering emails. This is fine in most cases, but becomes a problem if someone begins using a general email address as a personal one. I’ll give you a somewhat humorous — and tragic — true example. If they had made Contact_Us@EDCRegionalName.org a forwarder that sent emails to Marcie when she did work there, Marcie couldn’t have used it as her personal email address and they could have simply re-directed the Forwarder to whomever took over the job of handling those public emails. I get lots of calls from organizations asking how to “stop the spam!” Often these are places that have posted a list of all of the staff with their actual email addresses on their websites. The emails addresses are then collected by spam bots whose entire purpose is to crawl the web, harvesting any email addresses to sell or trade to spammers world wide. At that point, an organization’s only option is to use some really good spam filters, often paying for them. This is another place where using forwarders can be useful. By using an email forwarder, such as the staff member’s title or other general identifier, the staff member’s actual email address, which will appear when he or she replies to legitimate correspondence, has some protection (it’s not much, but it’s better than broadcasting the actual email account). And if the email forwarding address becomes totally inundated, it can be killed and replaced. Forwarders should be used when signing up for information or services, especially if you suspect the organization of sharing or selling its mailing list. I have had over 250 email forwarders because I always create a new forwarder when registering with an organization or service that hasn’t proven its trustworthiness. I often sign-up to receive newsletters, information, webinars on online marketing, analytics, or web development topics to keep abreast of this changing industry, however, each one gets its own unique forwarding address. And should I suddenly start getting flooded with spam from say” jw-launch@carolynecooper.com”, I know that JW sold (or shared) my email address and is a sleaze, so I won’t give him any money and I’ll delete the email forwarder” jw-launch@carolynecooper.com” so I won’t be bothered by him or any of his cronies again. Amazon, the New York Times, Netflix, ASPCA, pretty much everybody has their own email forwarder directing their emails to one of my 6 actual email accounts. It’s saved me a lot of grief in the past 20 years! Email forwarders can prioritize our correspondence. Let’s face it, some email is more important than others. By using email forwarders for sales, membership, billing, support, tech-support, as well as a general contact email forwarder such as information or contact-us, we can flag those as important and handle as soon as possible. Even if you are a company of one. Ssh. Here’s a little tip for all the very tiny organizations, using email forwarders can make you look a lot bigger than you are — as well as helping you recognize email requiring immediate action. Okay, that’s plenty of reasons to use email forwarders, so I’ll stop now. But don’t’ hesitate to leave any questions in the comments below. You really make it appear really easy with your presentation but I find this topic to be actually something that I believe I would never understand. looking ahead in your next post, I’ll attempt to get the cling of it!